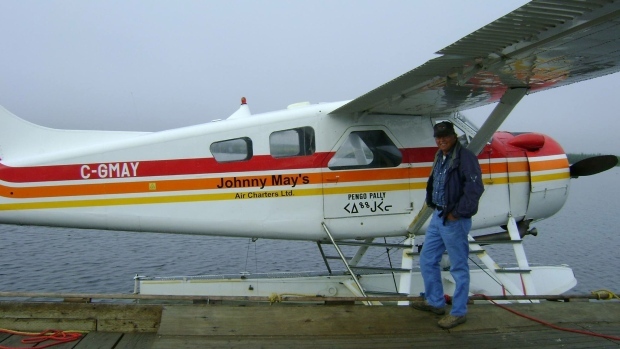 In an Inuit community in Northern Quebec, a famed bush pilot has taken on a role similar to that of Santa Claus on Christmas Day. Every Dec. 25, Johnny May flies his plane low over his hometown of Kuujjuaq, Nunavik -- a village of 2,500 -- dropping presents and candy as he goes. It's a tradition that started in 1965, and one that 70-year-old May has continued every year since. "At the beginning I used to do it myself," May told CTVNews.ca. "Mind you the village was much, much smaller, so it didn't take a lot of candy." The idea of the candy drop has its roots with the Hudson Bay Company, which would send candy to each of its trading outposts around the holidays. May's father, a manager at the George River outpost, would toss candy from a rooftop on Christmas morning. "After I became a pilot, I thought, it would be kind of fun to try it from an airplane," May said. "It was a hit." He said the candy drop was originally intended for children. "But now I think the kids are way outnumbered by adults," he said. "They all try and run in the direction my flight path might be," he said. "It's a lot of fun to watch." The presents have also changed over the decades. The candy is now mixed in with winter parkas and toques that are purchased with donations raised by the town's recreation committee. May is once again planning to fly his plane, the Pengo Pally, over the northern community this Dec. 25, and the 70-year-old says that this year could be his last. "I made up my mind a few years ago that if was I fortunate to be in good health and do it for 50 years in a row, that I would make it my last candy drop," he said. May said he is issued an exemption from Transport Canada to fly his plane low and drop items from the aircraft. But he said officials with the agency have indicated they will not issue an exemption to another pilot. "So I assume my last candy drop will be the last one with a plane," May said. He added that he has no doubt the candy drop will continue, but the presents may be dropped from a rooftop instead. Transport Canada has not responded to CTVNews.ca's request for comment. Whether 2015 marks the final year May takes up the Pengo Pally for the candy drop is not set in stone, as the pilot himself admits that his plans, "are subject to change." But May's involvement in the Christmas candy drop isn't likely to be forgotten any time soon. This year the Canadian Aviation and Space Museum published a children's storybook honouring the Christmas tradition called "The Kuujjuaq Christmas Candy Drop." An illustration from the children's storybook, "The Kuujjuaq Christmas Candy Drop." The candy drop is relatively unknown outside of Nunavik, which author Linda Brand said was one of the reasons behind publishing the book. "(May) is a role model in the North who has a huge heart, and a huge sense of community… this is the Christmas tradition of giving and sharing," Brand said. The museum partnered with Air Inuit to deliver more than 300 books to every school in Nunavik, Que. Brand hopes to get the book into every classroom across the Canadian Arctic in order to spread May's story. She said the museum is hoping to partner with Canadian businesses to help print additional copies of the book. She said May is well-known in Kuujjuaq for the candy drop and through his day job where he responded to search and rescue situations with Medevac. "Sometimes you have heroes in your community and you don't know until people from the outside tell you," Brand said. May, however, doesn't consider himself a hero. "No, no," he said. "Maybe for somebody like Linda from out of town. She thinks of people like myself as a hero. But when we all live together in town, I'm just another person."